When it comes to quadratics in GRE algebra, you might think the only equation you should memorize is, well, the quadratic equation: ax2 + bx + c = 0. But an expression like ax2 + bx + c can take many forms, and some come up more often than others on the exam. Call the more common ones classic GRE quadratic forms. Classic GRE quadratic forms come in three varieties. Set each form equal to its factored equivalent and you get what algebra aficionados call a “polynomial identity.” Don’t fret over the jargon. An identity is just an equation, and a polynomial is just an expression with multiple terms, like ax2 + bx + c. Here are the classic pairs of polynomials you need to know. When you memorize these forms, your goal is to recognize them on the exam, no matter what values or variables are used, and no matter which half of the “identity” you’re given. Here’s a problem that features classic form #3. If r – p = 7, what is the value of r2 – 2rp + p2? r2 – 2rp + p2 = ? 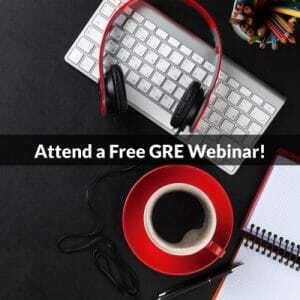 Imagine you didn’t know about the classic GRE quadratic forms. You might try replacing r with its equivalent in terms of p. Here’s what happens. Solve for r in terms of p.
An impressive bit of algebra—that leads nowhere. None of the answer choices uses r or p, so this sort of shuffling and substituting, whichever variable you target, just won’t work. Now, say you did know the classic forms. You’d recognize form #3 and readily find the right answer. Plug in 7 for r – p.
Want more tips like these? 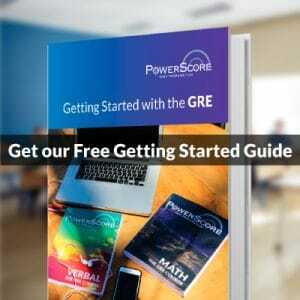 Check out the PowerScore GRE Quantitative Reasoning Bible! In the meantime, try another practice problem. If s and t are integers, s2 – t2 = 27, which of the following could be the value of s – t?